This recipe came into being with the help of my niece. I was visiting my brother and his family and my niece (Jacqueline) wanted to help with dinner preparations. We looked around and realized we did not have a salad. So we decided it would be great if she made the salad. The only problem was, we did not have the ingredients for a typical salad. So she and I went ingredient hunting and came up with the below. It was very good and Jacqueline was a great inspiration and help! If you don’t have the exact ingredients, no problem.. At the end of the recipe are some more ideas or replacements. In a jar with a lid, or a bowl with high sides (like a 4 cup measuring cup), pour in the olive oil, vinegar, chopped garlic, pepper and salt. If in a jar with a lid, place the lid on and shake over a sink until well blended. If in a measuring cup or bowl, use a whisk to mix all the ingredients until you get a well mixed dressing. Taste. Put the dressing aside at room temp to let the flavors interact while you prepare the salad. If your salad greens are not yet clean, clean them now and put aside to dry or dry in a salad spinner. Take out a large salad bowl. 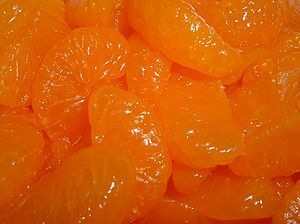 Open the packages of mandarin orange slices and drain over the sink. You can rinse if you wish, but not necessary as the juices will mix with the dressing when added. Place the oranges into the salad bowl. Place the diced mango into the salad bowl. Lastly prepare the apple. We do this last because apples turn brown after cut and left at room temp without dressing. Cut the apples in thin slices. Be sure to remove the core so there are no seeds. Place the apples into the salad bowl and add the salad greens. Toss all together, except the dressing. Salad dressing should be added no more than 5 minutes or so from serving a salad otherwise the ingredients you worked so hard on will wilt and release too much liquid watering down the dressing and lose its crunch. When you are just about ready, re-whisk/shake the dressing. Give it a final taste and taste adjustment (see step 2a – 2c), then pour only ½ of the dressing on the salad. Toss with clean hands (best way to make sure everything is coated), then taste some of the greens. If not enough dressing, add a little more at a time and re-toss until you like it. It is ok to have extra dressing, Just store in the fridge. If you put too much dressing, no one can taste all the goodness of your other ingredients. Instead of Mandarin Orange (or in addition to): Orange, Kumquat, Blood Orange, etc..
Posted by culinaryease on December 1, 2010 in Recipes, Vegan/Vegetarian and tagged Leaf vegetable, Salad, Spinach.